The Movie Sleuth drops an early review of Stomping Ground, out March 8th. Let's get this out of the way; Dan Riesser's Stomping Ground took me right off guard. My Lord and master, Chris George gave me this film to review, and from his demeanor and the little I front loaded myself with, I was preparing to make this movie nothing more than something for my eyes to look at while I ate my gourmet breakfast. So, I sat down with my meal and turned up Stomping Ground. As I chewed my eggs in the opening segments, I thought to myself “I thought this f----ing movie was about Bigfoot”, and kind of asked that question through the entire film. 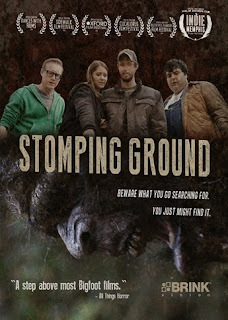 But, after my viewing of Stomping Ground, I realized quickly that this film is not about Bigfoot. While I found the plot to not be that earth-shakingly original, Stomping Ground was a damn fun movie to watch, and there were some real deep metaphors that ran through the fabric of the film. The interplay between protagonist Ben (John Bobek) and antagonist Paul (Jeramy Blackford) is direct statement on what the illusive 'Boojum' theoretically does. It marks its territory like many mammals in the wild do. This is illustrated by the Jonah Hill-like Justin Giddings playing Jed, who is continually pointing out the behaviors of 'Boojum' throughout the film. All of the performances in Stomping Ground were relatively good with the shakiest performance going to Tarah DeSpain in the role of Annie. I laughed out loud several times during this film and really found myself picking a side. There was a certain satisfaction I felt in the conclusion of Stomping Ground, even though the film didn't really seem to end, but rather just drunkenly fall on it's face and pass out. While Stomping Ground is a solid film, I really think that even clocking in at a modest 80 minutes was a little much. There were just some characters introduced that either needed to be fleshed out more in the plot or not be there at all to add any value. Stick with the story and what is interesting about the characters. Having Southern blood running through my veins, I really, really enjoyed the soundtrack to Stomping Ground, written by Ben Riesser and Ted Speaker. The bluegrass themes that weaved in and out of the film kept me wiggling in my chair the whole time with a smile on my face. Stomping Ground is about the battle for territory and the things you can loose in that battle. Yeah, it is campy, and yeah it is goofy. 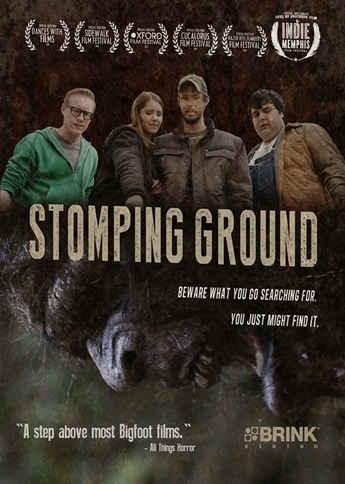 Yeah, the actual Bigfoot looks hilarious in all honesty, but Stomping Ground is just a fun movie with a little deeper message, and that makes it worth an honest view.